The Alter Bahnhof Video Walk was designed for the old train station in Kassel, Germany as part of dOCUMENTA (13). It was made by Canadian artists Janet Cardiff and George Bures Miller. They live and work in Grindrod, British Columbia. Collaborating since 1995, the artists are internationally recognized for their immersive multimedia works that create transcendent multisensory experiences which draw the viewer into often unsettling narratives. For this work, participants are asked to wear the earphone and use the iPod to watch the video which was documented by the artists. The video will direct participants to walk through the station. During this period, participants will see both the people walking in the video and in the real world. It will bring them a huge confusion of reality. In this confusion, the past and present conflate and Cardiff and Miller guide us through a meditation on memory and reveal the poignant moments of being alive and present. Drawing Constellation is a participatory drawing installation for augmented reality (AR). The work uses a modified public AR app, Layar, to upload drawings to a constantly animated and evolving virtual “constellation” centered within an exhibition space by GPS location. Participants are invited to use their cell phones or tablets to create drawings with their own choices of color, brush size, etc. Clicking the SAVE button transfers their drawing to a 3-D augmented reality space located and superimposed at a given site. The drawing of the submitting participant will appear in the center of a rotating moving galaxy of 20 or more drawings uploaded previously. A single user can change the whole galaxy by creating multiple drawings in succession. Through the live phone or tablet views on site, the audience is immersed in their own swirling drawings. In its simplest form Drawing Constellation is a communal drawing-sculpture for virtual space. It is one of a series of the artist’s works suggesting the presence of overlapping universes set in motion by contemporary social media space. In September 17, 2011, a protest movement called Occupy Wall Street began in Zuccotti Park in New York City’s Wall Street financial district. This movement which meant to against economic inequality drew global attention. A lot of people came there to express their opinion and protest. At that time, some AR artists began to create their own browser content and linked it to others coordinated by Manifest.AR. Its blog stated that the entire financial district of New York City was blanketed with these artwork augmentations. 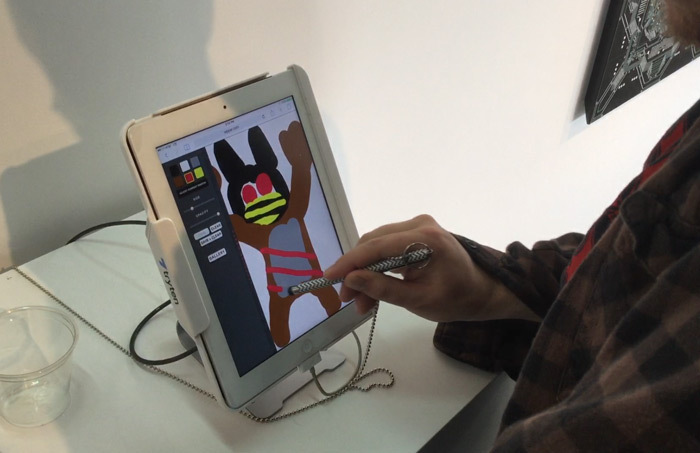 Artwork augmentations were created by means of the group’s augmented-reality app, which they called “protestAR”. Because Wall Street was soon barricaded off and people were no longer allowed to come in, an artist called Mark Skwarek created one protestAR work which can move the protesters from Zuccotti Park to the restricted area of Wall Street, placing them directly in front of the NYSE. This work featured still images of protesters waving American flags, banners and placards that feature slogans like “Jail bankers not protesters!” Then it allowed a pedestrian in the financial district who had downloaded the application could then point his or her phone to a street area that in physical reality around him or her was divided and restricted with multiple barriers, and saw the protestAR of that same space filled with Occupy Wall Street demonstrators.7 The demonstrator will walk in the prohibited area on the screen of the cellphone. According to relative reports, this Augmented Reality protest was rapidly spreading across the country. Through allowing people to walk in the illegal places, augmented reality gave activists the upper hand in the effort to create change in society. In this case, people can not only be the one who see the augmented reality, but also be the augmented reality. They can walk with augmented reality and walk in the augmented reality. They are two different experiences. Through augmented reality technology, people can walk to anywhere of the city. Though people are not truly walking there. It will make other people feel they are walking there because of its feature which is combining physical and virtual worlds. This kind of virtual walking can be used to show people’s attitude or other demands. ‘Chicago 00‘ refers to the corner of State and Madison where the city’s street numbering begins. It was one of the projects made by Geoffrey Alan Rhodes. It is a series of Augmented Reality mobile apps that will creatively share images from the Chicago History Museum’s massive photo archive. Selections from the archive are published to audiences outside the Museum through an Augmented Reality mobile experience: images superimposed onto corresponding sites through image recognition. With production grant funding from the Princess Grace Foundation, Chicago 0,0 is currently producing its first episode: a narrated immersive AR tour of the Chicago Riverwalk between Clark and LaSalle Streets: the site of one of the largest nautical disasters in U.S. history. While people are walking along the Riverwalk, they are actually exploring of the history of the Chicago River, the modern skyscraper, the Chicago Fire, and Chicago’s two world expositions.